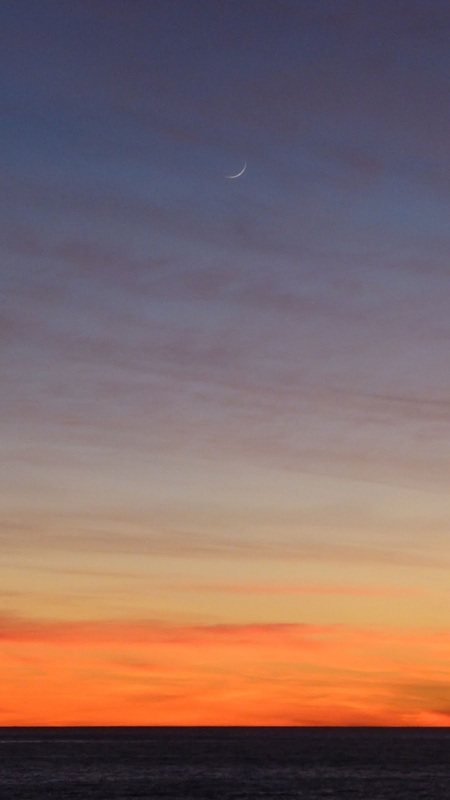 The November new moon sets in a sky turned crimson and gold by the Santa Ana winds. The wind that makes music in November corn is in a hurry. The stalks hum, the loose husks whisk skyward in half-playing swirls, and the wind hurries on. A tree tries to argue, bare limbs waving, but there is no detaining the wind. 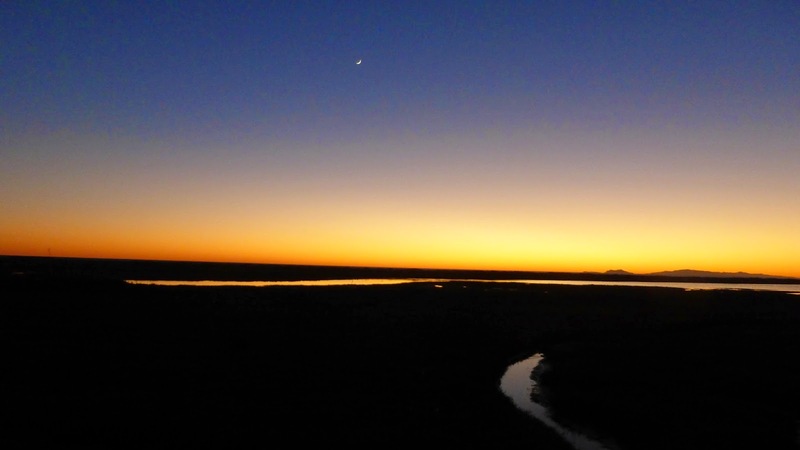 November in Malibu is a time of warm days, cold nights, wicked winds, fiery sunsets, and an ocean pressed so smooth by the Santa Anas that it looks like watered silk. By Thanksgiving, almost all of the winter birds have arrived, while the last of the fall pilgrims are sent on their way by gale-force Santa Ana winds. 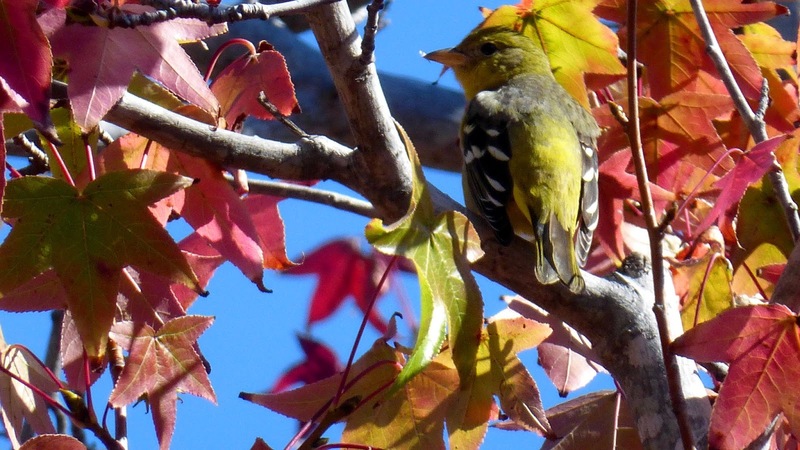 A lesser goldfinch, one of Malibu's winter residents, seeks shelter from the Santa Ana winds among the bright autumn leaves of a liquidambar tree. By the end of the windstorm, almost all the leaves were gone, but the finch is here to stay. At Zuma, the beach once covered in brightly colored umbrellas and towels is now crowded with gulls. The blue lifeguard towers, like oversized sheep, are pastured well away from the reach of winter tides, and sand barricades are in place to protect lifeguard headquarters and the other county buildings along the beach from storms. 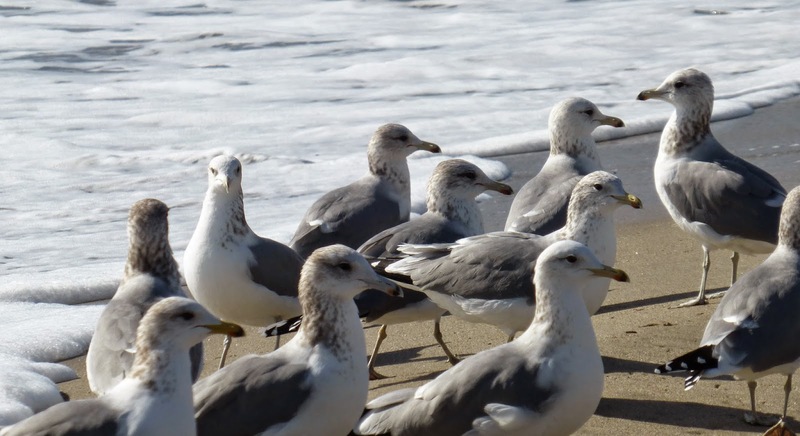 Gulls gather on the wet sand at the beach to escape the scouring Santa Ana-driven sand. There’s a distinctly autumn smell in the wind, compounded of dust and eucalyptus and sun-baked chaparral. It’s a time of waiting. Everyone holds their breath, waiting for the winds to die and the red flag fire warnings give way to winter rain. Gale force winds whip the waves at Surfrider Beach. 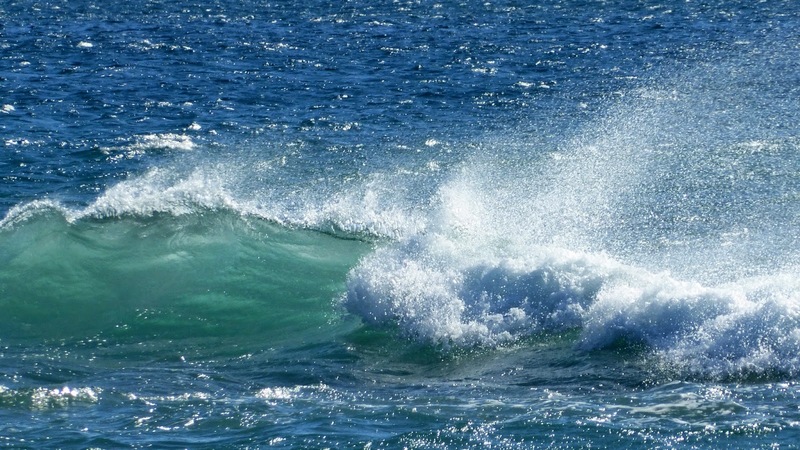 The Santa Anas have the power to subdue, or "blow out," the surf. Dame Wendy Hiller, in the brilliant Pressburger and Powell film I Know Where I’m Going, is stranded by gale-force winds and prays for the wind to drop so she can cross to a small Scottish island where her fate awaits her. Anyone who has lived through a Malibu fire storm can appreciate the intensity of that prayer. The poet Christina Rossetti famously posed the question "who has seen the wind?" The answer is NASA. 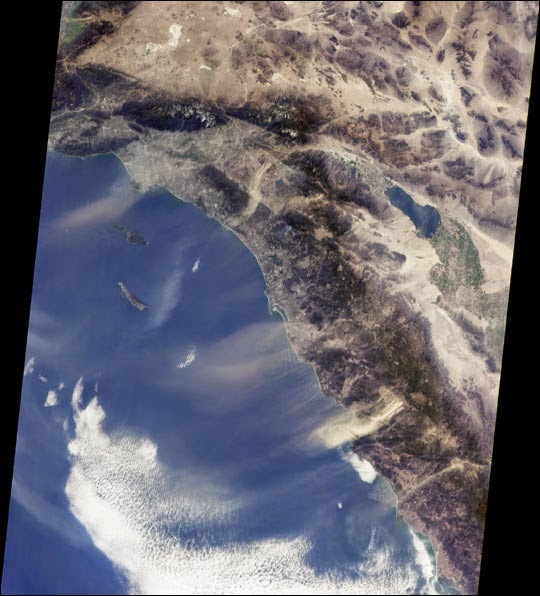 The space agency released this image of the Santa Anas blowing clouds of dust far into the Pacific. You can just see Malibu, with Point Dume facing south, in the upper left corner of the image. The Santa Anas go by a lot of names. 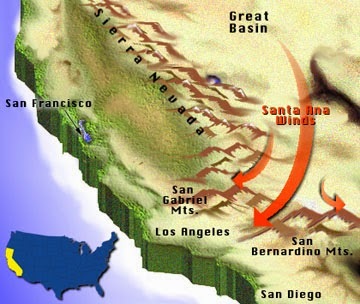 Some people meld the syllables together to make the name Santana, others call these fierce desert winds the red wind, the devil's breath, or the devil's wind, but the winds apparently get their name from Santa Ana Canyon, in Orange County, where the phenomenon was reportedly once thought to originate. It's unclear if the name was bestowed by Spanish settlers or later arrivals. However, the theories that the name derives from Satan or from an Indian word meaning evil wind seem to be entirely urban legends. 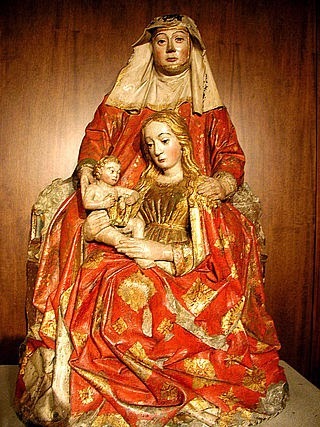 It seems equally unlikely that the name comes directly from the saint, since her feast day is celebrated in July, a time of year when Santa Ana winds are least likely to occur. And the tempestuous Mexican military leader Antonio Lopez de Santa Anna, who is also sometimes credited for the name, also seems unlikely, since he never even visited California and had no part in its history. Santa Ana, the namesake of Santa Ana Canyon, if not the actual Santa Ana winds, looks pensive and sad in this sculpture from the Cathedral Museum of Church of Santiago Campostella in Spain. Photo: Wikimedia Commons. 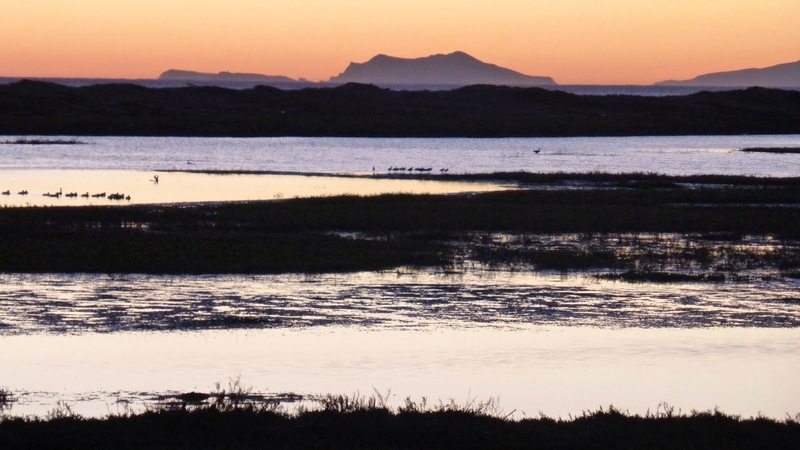 The Chumash must have been very familiar with the winds, but their names for the phenomenon have not survived, although it's said that the name Simi derives from a Chumash term for the little white clouds that often accompany the wind. Robert Fovell, a professor at UCLA in the department of Atmospheric and Oceanic Sciences, has examined the Los Angeles Times archive in search of the etymology of the name, but found nothing more exotic than the place name. According to Fovell, the earliest reference to the Santa Anas in the Times dates to 1881, just one year after the newspaper began publication. In 1893, the Times published a complaint from an Orange County resident concerning the "the misnaming of the winds which blow at times over almost all portions of Southern California, and which, unfortunately, in some sections of the southern portion of the State are erroneously called Santa Ana winds." The name, the writer insists, leads "nine out of every ten persons in the East" to conclude that the Santa Ana wind is "peculiar only to the immediate vicinity surrounding and contiguous to the city of Santa Ana." These winds are "an exceedingly unpleasant feature, especially in the fall before the rains have laid the dust." The writer recognizes that the winds "take the name of Santa Ana by reason of their passage through the Santa Ana mountain canyon, which is shaped very much like a large funnel" but insists it is "not a Santa Ana wind any more than it is a Los Angeles, San Bernardino, Riverside or San Diego wind." You can read Fovell's interesting and entertaining article here but, sadly, you won't find proof of either saints or devils in it. The wind sweeps away all traces of human activity along the shore and leaves in place of footprints calligraphic patterns in the sand. We aren't the only ones to experience this type of wind phenomenon. In the Alps it's the Foehn; in Provence, the Mistral; in Canada, the Chinook; in Argentina, the Zonda; and in Japan, the Oroshi. 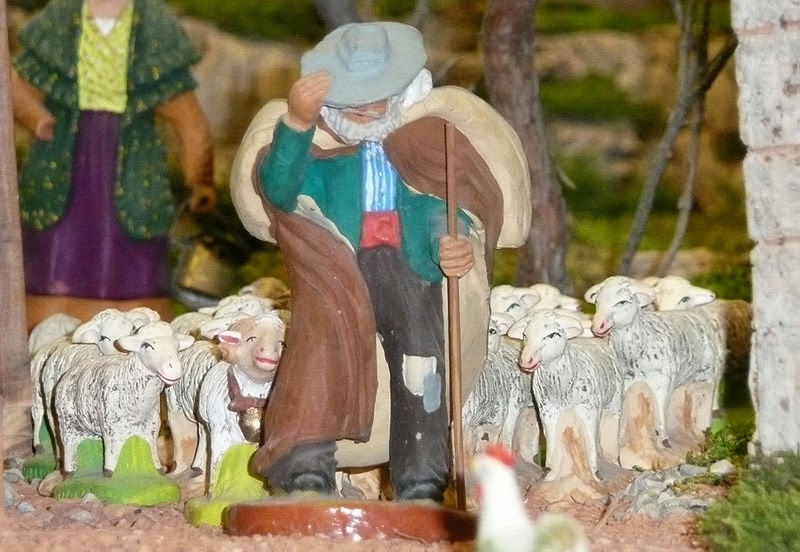 One of the traditional Provençal santons—Nativity figures—is a shepherd holding his hat to keep it from blowing away in the Mistral, the French equivilent of California's Santa Ana winds. This was the only character I could find that is traditionally associated with this type of wind, although my dad remembered his grandmother telling him that the Foehn, the Swiss version of the Santa Ana winds, was the ghostly horsemen of the Huns, riding with the wild hunt across the rooftops at night, and Perchta, a pre-Christian goddess who still lingers on in folk tradition throughout parts of Northern Europe, is also associated with the wild hunt and with the wild winds sometimes called "snow-eaters." I find it hard to believe there isn't a Californian equivalent recorded in some long-forgotten ethnographer's notes. Our winds are so fierce and so unforgettable that it seems they must have figured in stories and legends. Photo: Marie Blanche Sorribas, Wikimedia Commons. Most of the winds of this type begin as cold air in an area of high pressure. As the cold air travels around the high pressure system (clockwise in the Northern Hemisphere; counterclockwise in the Southern Hemisphere) it gains speed and is squeezed into the surrounding low pressure areas. The wind is heated through compression and gains speed as it pours through mountain canyons like water down a drain. 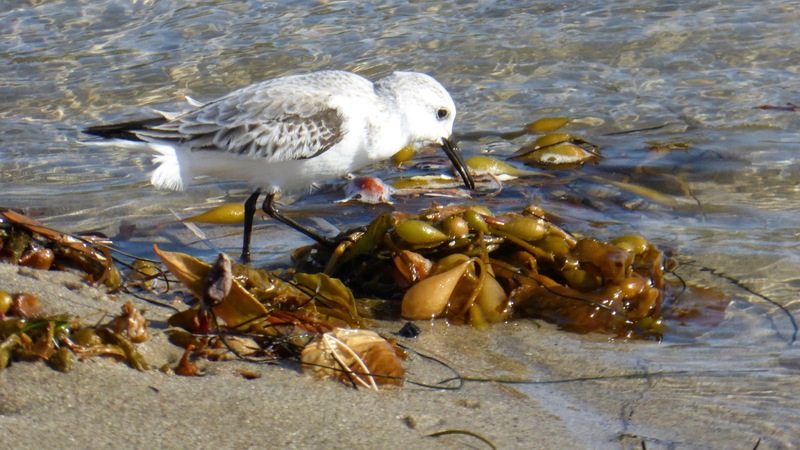 A tiny sanderling, its feathers blown every which way, ventures out to forage in the tide wrack, despite the wind. Winds like the Santa Anas have a special Greek name: Katabatic, which means to drain, or flow downhill. While the Santa Ana can reach speeds in excess of 70 mph, the Alaskan Williwaw, also a katabatic wind, has been clocked at over 140 mph. For Santa Ana winds to occur, the air in the Great Basin east of the Sierras has to be colder than the air at the coast. This NASA graphic shows the distance the winds travel before arriving in Los Angeles. In many parts of the world, this type of wind is thought to cause madness and illness. In Germany they even have a special word for it: Föhnkrankheit. In Southern California madness isn't nearly as much of a worry as fire. All of Malibu's major wildfires have occurred during Santa Ana windstorms. Along with the fear of fire, the devil wind really does bring a host of lesser ills: migraines, allergies and nose bleeds, among them. Also static electricity that plagues the cats and transforms long hair into Medusa's snakes; downed trees, branches, and palm fronds; and clouds of dust that covers every surface. 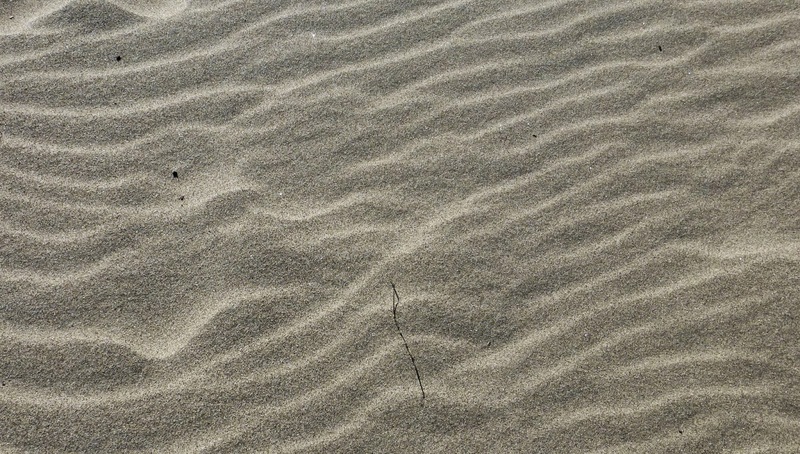 At the beach, wind-driven sand scours the shore. In the hills, the wind screams down the canyons, breaking branches, sucking the moisture out of the vegetation; and even tipping over the occasional cyclist or high profile vehicle. Squid season has extended far into autumn this year. The ghostly lights used to attract market squid into the nets have been a constant presence off the coast of Malibu. The fishery only closes in the fall when it meets the 118,000 short ton limit. According to the California Department of Fish and Wildlife, as of November 26, 2014, total landings of market squid are 114,649.3 st. 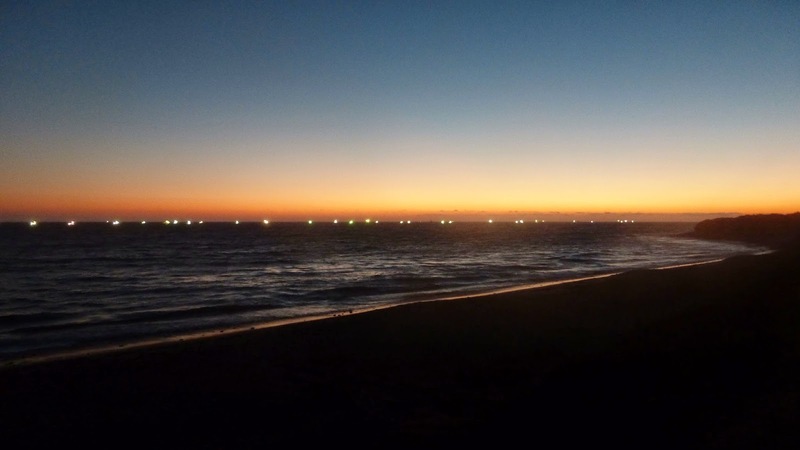 The squid fleet's continued presence off the coast at County Line was lucky for a group of kayakers swept out to sea by the Santa Anas. Two of the six were rescued by the fishers. On Sunday in western Malibu, where the Santa Ana winds can rip down the canyons at more than 60 mph, six kayakers were swept out to sea. News reports stated that the squid fishers, anchored off Leo Carrillo, were able to rescue two of the kayakers. Lifeguards and Ventura and Los Angeles County emergency crews used jet skis and air support to reach the other four. The Malibu Times reports that the rescue effort involved 28 emergency responders. Four stand-up paddleboarders were swept away the same day, this time near Surfrider Beach, according to the same article. Fortunately, there were no serious injuries in either incident. The Santa Ana Winds can make the sea look deceptively smooth and calm. "At this season begin to blow the Santa Annas [sic], the fierce autumn wind storms, — dreaded, to be sure, but zephyrs, compared with cyclones. Three days they blow, and often precede a rain. They are a blessing in disguise, for beside their sanitary, microbe-dispelling effects, they also drive the dormant seeds hither and thither, to distribute them equally on the surface of the land. This task accomplished, down pour the early rains and up come, as by magic, the living green grasses out from the browned hills and fields..."
A gaggle of cormorants are blown across the sky at sunset. These birds are powerful fliers, divers and swimmers, but they are no match for the wind. “The violence and the unpredictability of the Santa Ana affect the entire quality of life in Los Angeles, accentuate its impermanence, its unreliability. The wind shows us how close to the edge we are." It isn’t all bad. When the winds drop we are left with the illusion of summer: bright sun and vivid blue sky and sea. Unexpected vistas are revealed: the Los Angeles skyline emerges from the haze and smog; the Channel Islands appear like the lost lands of legend out to sea. At night, the Point Fermin lighthouse flashes in the darkness, while Orion, his faithful hound at his heels, strides across a brilliant field of stars, once the red glow of sunset has faded. 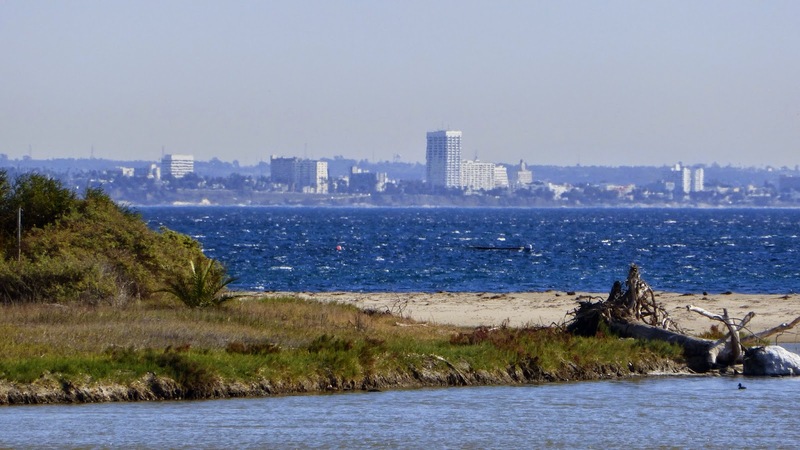 Santa Monica, with Los Angeles beyond, appears like a mirage beyond the sand berm at the Malibu Lagoon. The water impounded in the lagoon is relatively calm, but the ocean in the bay is being whipped into wild whitecaps by the gale-force winds. The current round of Santa Anas is expected to die down just in time for Thanksgiving Day, leaving warm weather and calm skies. My mom remembers spending one of her first California Thanksgivings at the beach in Malibu on just such a day. For my parents, who both grew up in places with snow and ice from November until March, it seemed like a miracle. More than 50 years later, it still does. The Channel Islands are revealed by the wind, emerging dreamlike from the fog that usually shrouds them from view. November 22 marked the first anniversary of The Malibu Post. We've had nearly 13,000 visitors in the past 12 months. I am grateful and thankful to everyone who has taken the time to read these pages, but especially to my family, friends and neighbors. Thank you. Wherever you are, and wherever you are going this Thanksgiving, dear reader, may the road rise up to meet you, and the wind be always at your back.